For anyone who has ever been involved in amateur dramatics, Alan Ayckbourn’s A Chorus of Disapproval will ring disturbingly, yet hilariously, true. Its plot revolves around the endeavours of the Pendon Amateur Light Operatic Society to stage a production of John Gay’s The Beggar’s Opera. Guy Jones, a newcomer to the town, finds himself in the smallest of parts before being promoted to larger and larger roles as others drop out one by one. In the process, this somewhat naive character becomes increasingly caught up with the financial affairs, not to mention wives, of several society members. The genius of Ayckbourn’s writing lies in his ability to use an amateur production as a proxy for all of the ‘politics’ that go on in daily life, while never sidelining the importance of the play itself. As Dafydd, the director, points out, his whole world outside the theatre may be falling apart and yet all he cares about is getting his show on the road. In Trevor Nunn’s production the various themes and dynamics are introduced clearly yet gently, so that we instinctively tune into them without ever feeling they are too contrived. The vocal performances are also ‘pitch perfect’, being neither so bad as to be unconvincing or nauseating, and yet (deliberately) never so good as to suggest that we are not staring at amateurs at all. Nigel Harman achieves the right balance between naivety and quiet charisma as Guy, so that the idea that he could actually have an affair with, amongst others, Ashley Jensen’s Hannah becomes highly believable. But it is Rob Brydon as Dafydd who steals the evening with his authentic Welsh accent, comic tirades and boundless enthusiasm for putting on a show. Such an obsession as his may seem ridiculous to any rational outsider, but we’ve all been there, and it is Brydon’s convincing performance that reminds us of that very fact. Until 5 January 2013 at the Harold Pinter Theatre, Panton Street, London, with start times of 14.30 and 19.30. Tickets (£10-£85): 0844 871 7622 or click here. Londonist received a complimentary ticket and programme from Premiercomms. 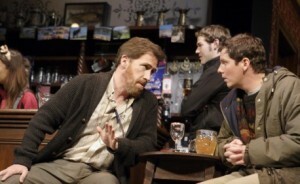 Photo: Rob Brydon as director, Dafydd, and Nigel Harman as newcomer, Guy.